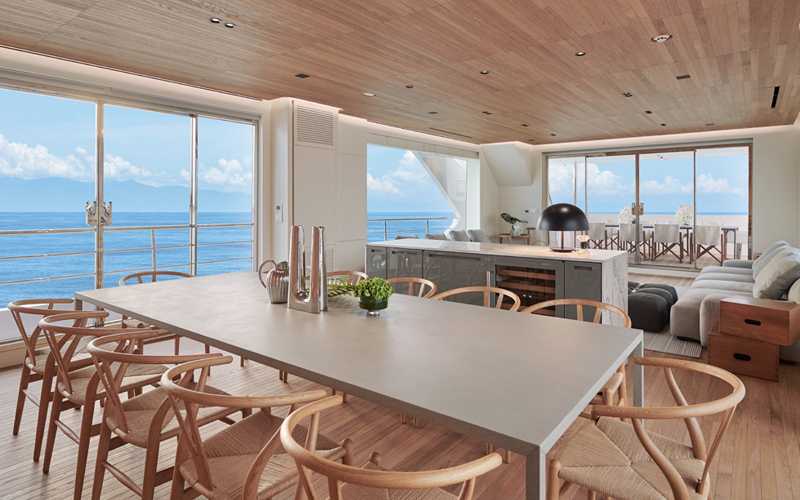 Custom features abound on the new and unique Horizon CC115, purposely designed to suit her South American clients’ yachting lifestyle. The Horizon Yachts CC series is a division of the company that specializes in fully customized or limited series designs, allowing our clients to explore their options and truly “Define their Horizon” in the form of a unique luxury yacht – one that suits their lifestyle without compromise. From the exterior profile to the interior layout and bespoke furnishings, the brand-new Horizon CC115 superyacht is fully tailored to her owners’ preferences. 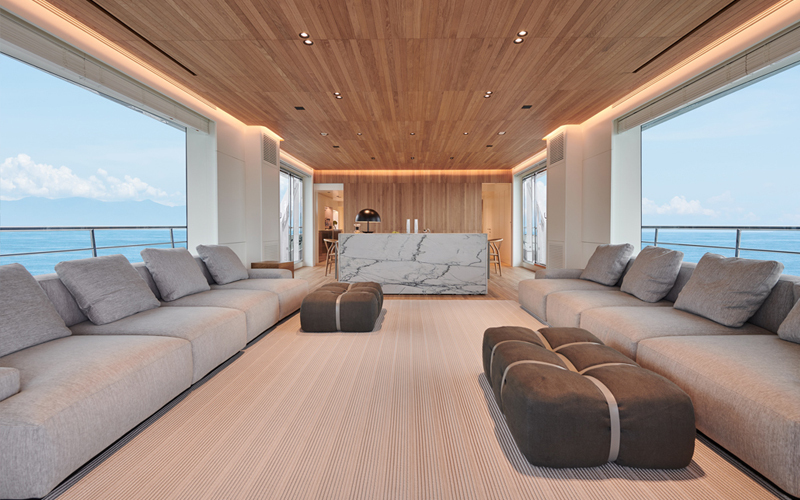 From the initial build meetings, it was clear that the clients knew what they wanted for their superyacht, and a partnership was developed between the client, renowned luxury yacht designer Cor D. Rover, and Horizon’s in-house design team to bring the owner’s visions to life. The CC115’s design was driven by her knowledgeable and experienced owners’ love of spending time with family and friends. 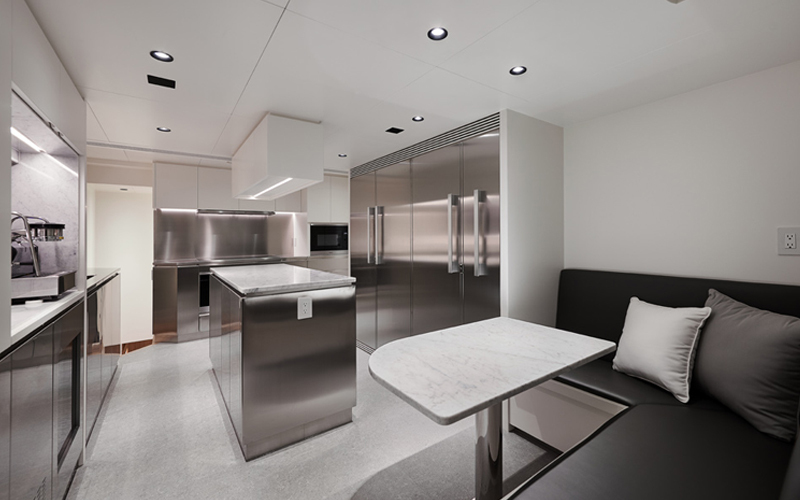 Working with Horizon and Cor, the owner designed an exterior profile highlighted by expansive windows to create a bright, naturally-lit interior and afford panoramic views while underway. 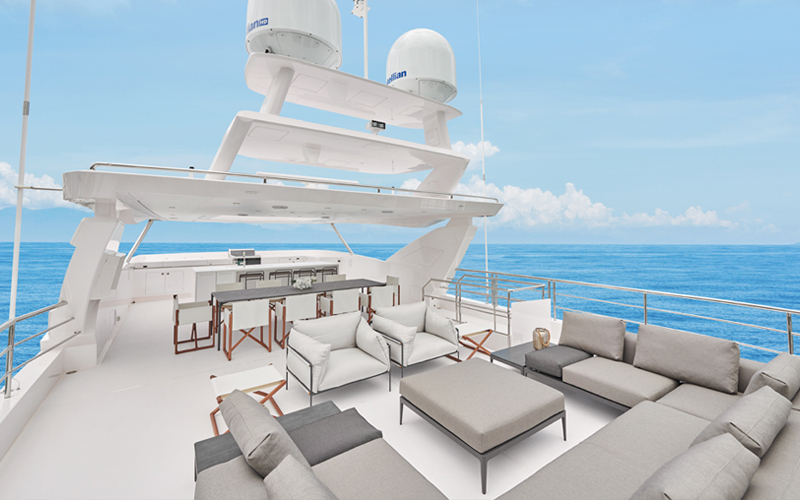 Features such as the manually operated swim platform – which allows the owner’s sea plane or jet skis to be transported – and the 13.5-degree angle on the bow cushions, so family and friends can share a movie night together, are just a few custom-built examples onboard. Architecture and Interior design firm Taller ADG worked alongside Horizon to create a modern décor that invites the outdoor environment into the 25’ beam. 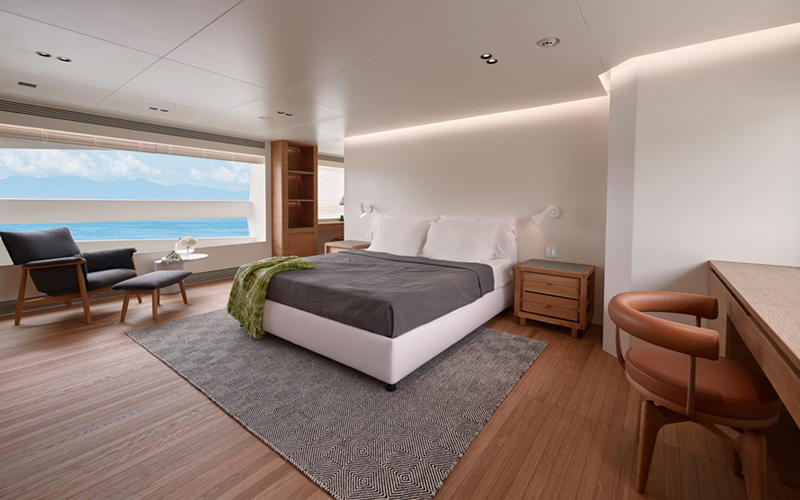 Bespoke furniture complemented by tones of silver and grey and highlighted by upscale Listone Giordano wood floor as well as custom Dessié’s furniture from Italy, further distinguishes this stylish interior, which accommodates guests in five spacious staterooms including an on-deck master. 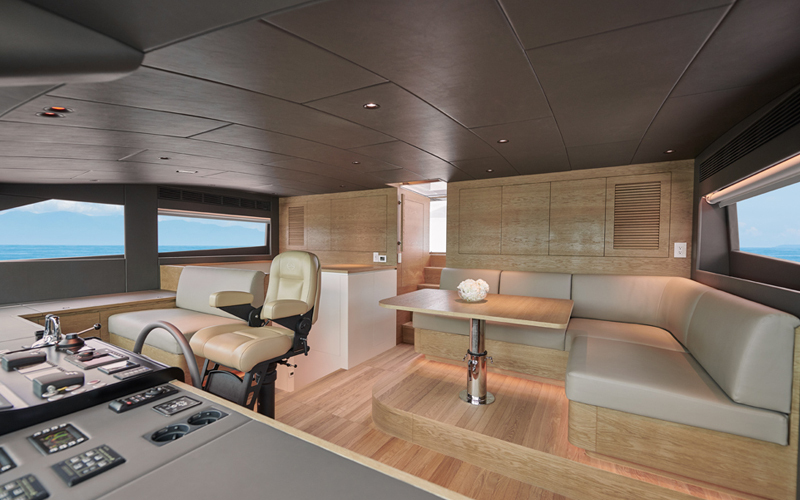 Equally thought through in every detail is the CC115’s layout, which provides a relaxing salon with dual TV’s, full beam on deck master, plus four ensuite cabins below and a “convertible” captain’s cabin that can be utilized for guests or crew. The CC115 also boasts a spacious beach club, accessed by large sliding glass doors, that features a day head and plenty of storage for the family’s water toys. 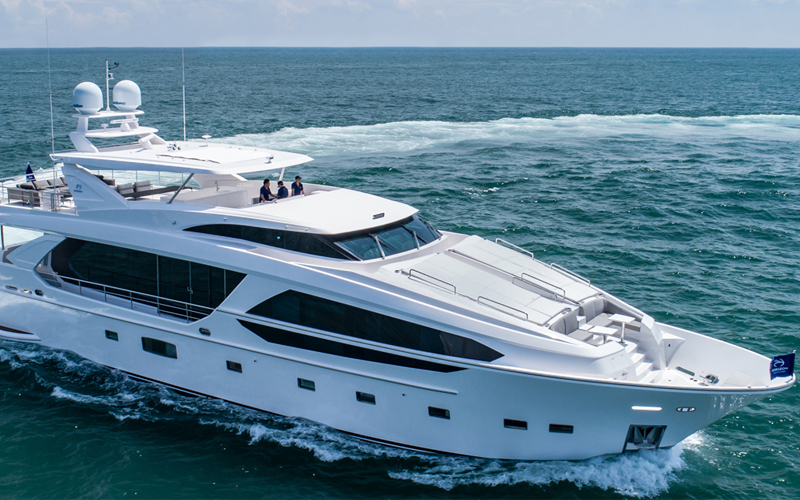 With accessibility and usability being important features for the owners, the CC115 design incorporates a Portuguese bridge with access to the bow seating, while a hidden flybridge helm and interior raised pilothouse with dual exterior wing stations offer ease of operation from either of the two decks. Powered by twin CAT C32s of 1,600hp each, the CC115 cruises at 12 knots and achieves a maximum speed of 17 knots. After successful sea trials, the CC115 will be delivered to her very satisfied owners when she makes her world debut at the Fort Lauderdale International Boat Show October 31 – November 4, 2018. For more information, please visit horizonyacht.com.